Phenomenal is explained as being exceptional, extraordinary, remarkable, outstanding, amazing, astonishing, astounding, stunning, staggering, marvelous, magnificent, wonderful, sensational, breathtaking, and miraculous. I believe that each and every one of us is exactly that, born for a reason and purpose far greater than what we could ever understand! That what we do matters and what we don’t do also matters. I believe that what we do sends ripples so far that we can never truly understand the impact of our decisions, words, actions and thoughts. I believe that we are phenomenal, with unlimited potential and ability to create a life we dream of. The feminine is born to be happy, to be joyful and filled with love, life, energy and creativity. She is an amazing force, many of us know this but many of us have forgotten. I am here to remind you, I am here to remind me, that despite what is going on you can create a life you LOVE and this is why I have dedicated myself to creating Phenomenal Woman. 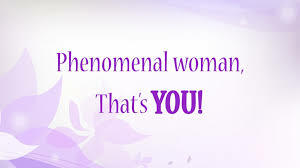 A series of programs, workshops and retreats designed to encourage and support woman into claiming their greatness. You can create an extraordinary life and be anything you choose to be and do anything your heart desires, you can have it all. There are so many examples of extraordinary woman out there doing exactly that. You have one extraordinary life, so live it! Your life is to be enjoyed and to do all the things you dream of, but how do you do this when there seems to be so much adversity, so much hardship, so many obstacles, and heart ache, when your path to your happiness and fulfilment is just not clear. Your only job is to be happy, to be joyful and to LOVE and through that we will become the best versions of yourself. Through that you will discover who you are, and what you have come to do. I am going to help you remember, step by step, week by week so that together we will step into our greatness and create a life of deep meaning and purpose. All I ask in exchange is that you share your stories, share your success and adversities share your love and your heart ache, so that through your voice and through your example other woman will rise up and claim their worth, and lead their best life. Your life matters so shine! Shine Bright!!! Do not be afraid to be PHENOMENAL!!! You were born for great things!! I want to tell you a little story of a Phenomenal woman I met 7 years ago, her name is Rochelle. Like many of us, she was hurt, she was struggling, she was disillusioned with no clear path. But with heart and determination she turned her life around and continues to live bravely. I met Rochelle 7 years ago, she came to my office after I had received a very distressing phone call from her father. See Rochelle had been hospitalised that week, twice for cutting. Her father explained that she had issues with alcohol and drugs, she had an eating disorder and had been recently diagnosed with a psychiatric disorder, but as she sat in my office I decided to see past all that pain and see the light that shone within. I have to be honest and say it was not a pretty sight that morning, Rochelle was obviously affected by drugs and could hardly sit on her chair, in fact she was slouched over the side of the chair and I was certain that her body would hit the floor any minute. She seemed really uninterested about being in my office, re-telling her story of pain and self- abuse ….she was beautiful and despite what sat before me I was more interested in what Rochelle would be doing with her life if she didn’t have all this to occupy her time with. So I asked her, “ Rochelle, what would you be doing with your life if you didn’t have all these problems?” , she seemed a little confused by my question to start with , she paused, she thought, and then she sat up as if to come out of her drug induced state and communicate with me enthusiastically about how she would be working in entertainment or fashion. Her eyes lit up, she had passion and energy that didn’t exist a minute ago, it was so interesting to see this shift in her attention and enthusiasm right before my eyes. Rochelle and I worked intensively together for a good 7 weeks and then monthly and then eventually occasionally. I am happy to say that Rochelle leads a very different life today, she fulfilled her dream of becoming a fashion designer, she won the award of honourary student and had the honour of presenting her fashion line at Melbourne fashion week. She has her own fashion label and has had her personal and business story featured in print media. She had her goal of Ruby Rose fashion icon wear one of her designer jackets in her promotional work, and she now lives both in Melbourne and Bali. There is so much more to be said about this incredible girl. Rochelle overcame addiction, self-mutilation and self-hatred, and we still stay in touch today, why? Because life can be messy it has its challenges, and although today I can happily say she is living her dream, and her life is magical in many ways it still has its challenges and probably always will, because as long as we are living and growing we will be challenged. Growth can be painful and messy, but if we do it together, supporting and loving one another the journey can be more peaceful and nurturing, more understanding and inspiring. We can do this by supporting one another, loving one another, seeing one another, encouraging one another, and allowing ourselves to fall and heal when that happens too. None of us our perfect, no life is perfect, in fact I have come to embrace the phrase, “Imperfectly perfect but worthy of LOVE”.